Continuous parison type co-extrusion blow molding machine with view strip. Suitable to run blow hdpe; ldpe; pp; hm; eva; materials. 2 to 10 ltrs. Hydraulically driven, plc controlled, 100 point moog parison controller, double layer & view-strip attachment. 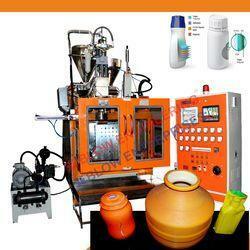 Looking for PLASTIC BLOW MOULDING MACHINE CO-EXTRUSION LAYER ?